Ultimately, Photography is subversive not when it frightens, repels, or even stigmatizes, but when it is pensive, when it thinks. Beginning sometime in the mid 1950's and up until 1975 over a million photographs were taken of the war in Vietnam, more than any war in history up to that point. Almost a quarter million of these images are located at the National Archives, but many have not been seen and are stored away for future historians. The operations and direction of military photography was organized by the Army Pictorial Center from the Pentagon. Aside from the official photographers working for the defense department there were also self-assigned photographers who, upon request, received a press pass from the Pentagon and were allowed into the country to follow troop movements as they saw fit. They were free agents and took the risks that befell the troops that they chose to join. There were no time limits to their stays and no restrictions with regard to movement or reportage. The Pentagon’s only requirement was that a certain discretion be used when identifying the dead so that their families could hear the news, not from the local or national newspaper, but from an officer who would arrive at the family house and personally deliver the news. Such freedom for a journalist in a war situation after Vietnam was out of the question, as photographers subsequent to that war were carefully monitored, guided, briefed and instructed - and then they were escorted to selected pre-arranged areas. Nothing was left to chance. This change was due primarily to the photographers who covered the Vietnam war and depicted atrocities, suffering and human devastation and waste to such a degree that the population in the USA, by the early seventies, turned against the war. Sean Flynn and Dana Stone are probably the best known of these fearless independent photographers. Both men are still listed as missing in action since they disappeared in 1970 on a convoy moving from South Vietnam into Cambodia - the new center of action then as the Americans made one last ditch effort to win the war in a massive bombing campaign. Flynn and Stone simply disappeared in the chaos - their bodies were never recovered - a story that already hints at the corrosive death instinct at the heart of the colonial enterprise depicted in Joseph Conrad’s An Outpost of Progress and Heart of Darkness, two novellas that would anticipate the primary American tragedy of the 1960’s by half a century. In the 1970's the latter novella would be adapted by John Milius, Michael Herr and Francis Ford Coppola into Apocalypse Now (1979) - one of the few feature films from Hollywood that dealt with the Vietnam war up to that point. 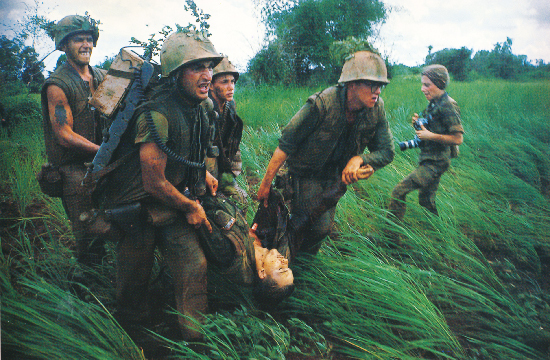 Most photographers in Vietnam were neither free agents nor were they working for the defense department - they had contracts with agencies such as United Press, or Magnum - or they worked directly with magazines, such as the American Look or the French Photo. Under normal circumstances photographers were dispatched into Vietnam for three-month tours of duty from a training base in Hawaii. Three months were considered the maximum amount of time that a photographer could be in the line of fire without suffering possible consequences either physically, mentally or a combination of both. That was under “normal” circumstances but as several writers who lived through the experience remind us in their work on the sixties the circumstances were not normal. Here is a small sampling of the writing from the people who were, at the time of the war, the "adults in the room:"
All of the people that I have photographed in the last year and a half have been affected by Vietnam – as has all of American life. 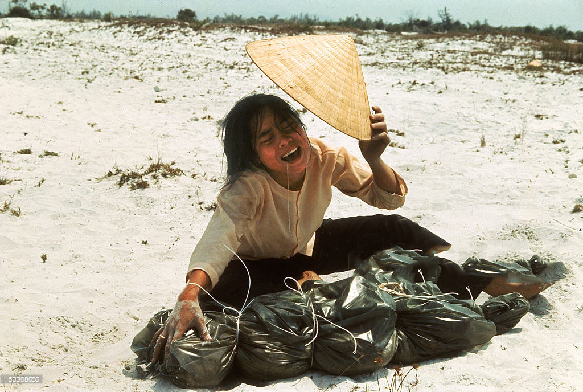 Vietnam is an extension – unfortunately – of everything sick in America. "He (Richard Nixon) convinced TV network news that "we are on our way out of Vietnam" fully four years before the last American combat troops left Vietnam (November, 1975). Meanwhile Nixon accelerated the concealed war (in Laos and Cambodia), the one that pulverized Indochina, but cost few American casualties. In March 1969, aiming to impress Hanoi with the possibility that he would stop at nothing, he began bombing Cambodia in secret. Over the next fourteen months he authorized 3,600 flights and dropped 110,000 tons of bombs on neutral Cambodia. He bombarded North Vietnam, and threatened still more furious attacks upon Hanoi and its infiltration routes south. His goal, like his predecessors, as Seymour Hersch has argued, was to bomb his way to victory. Nearly 10,000 Americans died in Vietnam during 1969. More than 20,000 Americans, and several hundred thousand Vietnamese, died while the war was "winding down." All told, between 1965 and 1973 Nixon and Johnson dropped more than eight million tons of bombs on Indochina - more than four times what the US dropped during all of world War II." Burrows worked for Life, which was then one of the most prestigious photo magazines with worldwide distribution. Most colleagues in his field like Phillip Jones Griffith (self assigned), Kent Potter (United Press), Keisaburo Shimamoto (Newsweek), Nick Ut and Eddie Adams (both working for Associated Press) all favored traditional compositions in black and white that captured the drama with as much visual power and as little formal fuss as possible. Burrows shot mostly in color and had a compositional sense that was decidedly not traditional. In fact at times it was extremely unusual to the point of calling attention to itself. But to what end? In part this unusual framing combined with his color sense gave his work the feeling known as synesthesia. You can hear helicopter blades and smell the strange combination of sulfur, gunpowder and jungle mustiness, and you can feel the earth shaking from armored vehicles passing. But these things are very subtle. The thing you notice first is the color. This is David Halberstam: “He once talked the Vietnamese Air Force into taking doors off a fighter-bomber so he could lean out and shoot as if he were virtually outside the plane. When other photographers asked for the same privilege, they were turned down. When they complained they were told by the authorities, “Mr. Burrows’ request was granted not because he is a photographer but because he is an artist”. What Burrows thought of himself in that regard we don’t know but there is no question that, as David Halberstam so well put it in his biography, he understood what color could do. In Burrows color seems to act as a counterpoint to narrative action. It slows everything down and makes a space that we can explore at depth. This creates a tension between the narrative action, which as in most photojournalism is swift and geared towards dramatic action, and the color and framing which are more reflective and even suggestive of other subtle narratives of their own. That leaves the question of the reason for his compositional choices and color palette, qualities that would be adopted as visual reference by Vittorio Storaro and Francis Coppola for Apocalypse Now in which Dennis Hopper portrays a flamboyant, acid drenched photojournalist (modeled loosely on Flynn and Stone) who cuts himself loose from photo agencies and deadlines to join Kurtz on his journey into the unknown. But Burrows’ images don’t need tracking shots, the music of The Doors, or sound effects layered on multiple tracks. They come already loaded with an idea about how to accomplish all of these things in a single, silent, frame – how did he do that? Larry Burrows arrived in Vietnam in 1962 when he was 36 working for Life magazine – by then he was already a veteran. He served his long apprenticeship during the 1940’s at the Life magazine offices in London, the city where he was born and raised to working class parents. His father was a truck driver and his mother a housewife. He got a job with Life in 1942 when he was 16 and in the forties and fifties he was known by the pros at Life, then probably the most prestigious photo magazine in the world, as “our darkroom tea boy” - a gofer that did the jobs in the darkroom no one wanted to do, including developing and drying thousands of rolls of film taken by photojournalists during World War II. In later life he became notorious for one infamous case (that wasn’t true but made for a great story) that while processing negatives from the front he accidentally over dried many of Robert Capa’s signature images from the D-Day landing causing the emulsion to melt. This ironically gave the pictures, or what was left of the eleven negatives that survived (from a total of 72) a greater sense of urgency and authenticity. He always refused to say who the real culprit was in the story and people teased him about it for years to come. Burrows was cordial, generous, soft spoken and took it in stride – and he never did say who burned those pictures by Capa. His first assignment after the war was as an assistant photographing great artworks in color throughout European museums. Is this where he got his color sense, or at least where it developed into a formidable aesthetic talent? He was one of the first photographers to switch to color and the first to have the opportunity to showcase it in a major magazine. While most photojournalists were on the clock with newspaper deadlines that were rigorously standardized, Burrows had the luxury of long photo-essays. His initial spread for Life from 1963 took six months to complete. David Halberstam: “So Vietnam as what he had long been waiting for…From the start, the best photos from Vietnam were his. He had a feel for the war and the people fighting it, for the special texture of it, and he understood well that if you were going to be a photographer for a great photo magazine, this was the ultimate assignment…” “The ultimate assignment” is a phrase from Robert Capa, who died in Vietnam in 1954, when the war was still a French problem. Burrows was a different kind of photographer from the dapper, sardonic Capa. He was serious, highly conscious of suffering, he stuttered when he spoke, and wore thick glasses. In pictures he looks like a weary, overworked professor. In 1963 Burrows made his first photo essay about Vietnam that appeared in Life Magazine with the title: We Wade Deeper Into Jungle War yet the generally upbeat tone of the war can be read between the lines in the titles that accompanied Burrows’ photo essays: Up High, Up Front in an Inscrutable War, One Ride with Yankee Papa 13, The Edge of Peace. When visiting the Life offices in New York in 1969 – the same year as the Woodstock music festival - someone from behind a desk casually asked him how the war was going. Burrows replied: “Well - you American chaps have quite a problem there - thank God it isn’t my war.” After a pregnant pause Larry Graves, one of the editors from Life responded: “Larry, if it isn’t your war, whose war is it?” That was the question of the decade. The question still reverberates like an aftershock in American culture today. Those aftershocks are so loud that Americans seem bent on creating every conceivable sort of noise to drown them out, to little avail as the sound of that catastrophe persists. For the editors in the home office of Life in 1969 the answer to that question was a mystery but the event was the most newsworthy “story” going. It was a war that in practical terms belonged to what was then known as the “press corps” which included writers, photographers, editors, filmmakers and videographers. They would only all be subsumed under the general term “media” in the following decades –swallowed whole by television. For the editors only two thing were certain: Vietnam was the story of our time, and Life’s main man in Vietnam was Larry Burrows. 1962 is early in the war, at least from an American perspective, but the Vietnamese had been fighting a guerrilla war since the French had made Vietnam an official colony - re-naming it French Indochina in 1887. The Vietnam war officially began in 1946 when Nationalist leader - and avowed Marxist - Ho Chi Minh declared independence from the French and demanded that they withdraw. The French responded by sending in troops to quell the "revolutionaries." Ho Chi Minh, realizing that the French had a vastly superior, modern army, went underground and began a guerrilla war of attrition. In 1954, Vietnamese general Vo Nguyen Giap trounced the French troops in Dien Bien Phu, in the northwest corner of Vietnam. Shortly after the French withdrew as they realized a long, drawn out war would not be popular at home. Since the French could not decide who should rule the new Vietnam, in Geneva, a European council decided to temporarily partition the country into the North, controlled by Ho Chi Minh, a Communist, and the South, controlled by Ngo Dinh Diem, an ally of the Americans. They set up a system to have countrywide elections two years later, in 1956, so the population could decide what to do - that is to choose between Communism and Capitalism. In 1956 Diem made the fateful decision to cancel the countrywide elections - that would probably have been won by the Communists - thereby setting up a final confrontation with Ho Chi Minh and the North. While there was already an American presence there - in the form of "advisors" - it was then that Eisenhower sent in troops to help Diem defeat the North Vietnamese Army (NVA), and prevent what the Americans called a "domino effect" - a theory that if Vietnam went to the Communists, all of the countries in the region would follow. In effect 1956 is when the war began in earnest and when Americans became directly involved. The Vietnamese had only known war for their whole lives, and were hardened and determined to rid themselves of colonial powers altogether, regardless of where they came from, or how long they had been the "masters." In Burrow's picture Diem, the president of South Vietnam, visits the troops to boost morale, using a French helicopter to arrive at the front lines – a trophy from the previous war. An interesting choice as some ten years later similar helicopters would also be abandoned by the American army - but this time the Americans made sure they were destroyed so the victorious NVA could not use them. Diem's impeccable white suit, the procession behind him, already looking like a funeral march on a hot summer day, and the immaculate flags of South Vietnam waving in a strong wind are strangely unreal and show a reality gap between the men and women on the field - dying by the hundreds in NVA raids - and the people running the war - acting as if victory were just around the corner, and drinks can now be served. It is one of the most insightful images of colonial power at mid-century linking Burrows to the great literary observers of colonial misadventures such as Graham Greene and Andre Malraux. But of course what is stunning about the image is the color - the brilliant yellows playing off the beige carpet and ground and the green and beige uniforms of the top generals in the South Vietnamese and American armies as they march toward the camera. The stationary soldiers lined up displaying their rifles on the far right of the frame create a beautiful counterpoint to the swirling flags, of stillness, as if they were holding their breath, as Diem cautiously moves forward, seeming to use his hat as a shield. By 1966 the United States had over 3,000 aircraft in Vietnam, altogether dropping over four times the number of bombs than were used in WWII against Germany and Japan combined. The aircraft used by the Americans varied wildly from vintage planes from the Korean war and WWII to the most advanced aircraft then available, the "Phantom jets." The technique the air force used was traditional air combat: Little prop driven planes that were loud and very visible, would fly low over enemy territory drawing fire from anti-aircraft guns, revealing the positions of NVA troops that always positioned such prized guns only near their troops or storage facilities. Once the NVA positions were established American air support moved in using Napalm, Agent Orange or, in this case, phosphorous bombs (also used in WWII in Dresden). Burrows spent nine months shooting from the air, often strapped down while the plane's doors were left open so he could hang out of the plane and look straight down - as in this case. Strangely he also made drawings of what he wanted to shoot for the pilots. While it is not unusual for a photographer to make drawings of what he wants to capture, it is highly unorthodox amongst photojournalists. Burrow's Aftermath... looks like a subtle ink or watercolor painting, influenced by one of the Japanese masters, and it is only only upon closer inspection that we see that the beautiful painterly white is not fog or mist but smoke from a village full of people, that presumably was controlled by NVA, that is on fire from phosphorous - a material that burns at 5,000 degrees and produces a dense white smoke called phosphorous pentoxide that is deadly. Operation Prairie launched in 1966 lasted for six months, and was an effort by American forces to cut NVA movements of supplies and men from the north to the south. It was the heaviest, and costliest - in terms of men and women killed - operation to date in the war. Seven infantry divisions, supported by air and artillery were involved. What they encountered was a well-trained and well-equipped regular army digging in for a long war. In Burrows' Operation Prairie, Evacuation we see four marines recover the body of a dead comrade and take him to a nearby evacuation helicopter. They are under fire while the blades of the helicopter create a windstorm visible in the foliage - to the right is French photographer Catherine Leroy, one of the few women photojournalists in the war. Leroy was an independent journalist - and a trained parachutist - who bought her own ticket to Laos from Paris and stayed in Vietnam for the duration of the war. At one point in 1968 she was captured by the NVA but, incredibly, she managed not only to talk (in French) her way out of it, but to be the first person to take photographs of the NVA behind their own lines, eating, relaxing, reading and strategizing. The pictures created a sensation - and her photo-essay became a cover story for Life magazine in 1968. While Burrows' image has been used as stock reference for countless war films since then - most famously Francis Coppola's Apocalypse Now and Terence Malick's The Thin Red Line (1998) - the poetics of the picture are unique to that situation. The weight of the fallen comrade is etched on the men's faces and is beautifully contrasted to the lightness of the wind that whips the long green grass - the fallen soldier is surrounded by life as the four soldiers make a final push to get him on that evacuation helicopter before something else happens. Note how Burrows consciously moves his camera framing to the right to include Leroy as she circles around the men to get her shot - almost tiptoeing - the counterpoint to the men's action is almost musical and breathtakingly poignant. Operation Prairie proved successful but costly. Losses in the operation pushed US casualties to their highest level of the war - for the first time twice that of the South Vietnamese. Shortly after the success of the operation much of the ground was abandoned, lacking strategic importance as the war shifted to Laos and Cambodia. In Third Battalion, 4th Marines... Burrows employs a technique that he would often repeat - the use of the tableau format. This format harkens back to 19th century European history painting or to even earlier religious artworks that Burrows was well familiar with. While the tableau was a favorite for European art - from the romantic Théodore Géricault to the classicist Jacques-Louis David- there is a major difference. European artist of the 19th century, regardless of their artistic allegiances, sought to fuse a particular narrative - often with arcane, pedagogical, references to classical mythology - with ideals of order, harmony, balance, and a fundamental conceptual essence that preceded existence. For Burrows it was the opposite. The five men in Third Battalion, 4th Marines... do convey a sense of order but it is predicated on the contingencies and random encounters of the moment, and their brief, precarious existence subsumes all other considerations. In this case existence precedes any essence - an existentialist maxim made, in this case, painfully real. Burrows waits patiently for the moment when the men create a triangle with movement and countermovement in perfect balance. The men pivot while the soldier on the left holding his hip, as if in a dance, holds himself steady using a plank from a box of hand grenades. That plank is crucial visually as it cuts a perspective line between the men, opening up the space to give it a more three dimensional resonance connecting it to the trees and the mountains and clouds in the distance. The soldier on the right, leaning on his left elbow, does the opposite - anchors the work to the ground - again point-counterpoint. Most of the pictures that Burrows took were titled later by the staff at Life - he provided field notes on the location and date, and names of the men involved if they were available. This is one of the few pictures that Burrows ever formally titled himself: Reaching Out. It depicts a group of soldiers in a place called Mutter Ridge, in October of 1966. The African American, with a bandage around his head reaches toward his dead commanding officer sitting on the ground holding, with his left hand, a piece of wood, as if it were a rudder on a ship, to hold himself steady in his final moments. A soldier on the left holds the bandaged man back. On the right two men examine a map. Again Burrows deploys the tableau format brilliantly - it is probably his best known photograph and was featured, as a two page spread, in Life magazine in 1966. Note Burrows' framing as he places a hand on the far left side of the frame and another on the far right almost as a parenthesis, to the two hands of the African-American soldier "reaching out" - with the main action, between the living and the dead, suspended in space as if in a dream. Massive troop movements of tens of thousands of NVA troops heading south - the largest yet recorded - required a quick response from American air calvary and ground troops. Operation Pegasus is launched to ferry helicopters and bring supplies and artillery to the front lines - the purple smoke is a signal for the helicopter that it is safe to land. The smoke and dust directly below create a suddenly beautiful space and light that is almost metaphysical and psychedelic were it not for the insistent narrative line - the immediate job at hand that covers the bottom of the picture - getting those supplies. Because of the purple smoke the image has a hallucinatory quality also reminiscent of Michael Herr’s prose, what he called "Opium Space:" “Release graffiti on the walls at Tan Son Nhut airport, where Flynn, almost overtly serious for a second, gave me a kind of blessing (“Don’t piss it all away at cocktail parties”) and Page gave me a small ball of opium to eat on the flight back; stoned dreaming through Wake, Honolulu, San Francisco, New York and the hallucination of home. Opium space, a big round O, and time outside of time, a trip that happened in seconds and over years; Asian time, American space, not clear whether Vietnam was east or west of center, behind me or somehow still ahead.” Herr’s brilliant writing, and Burrow's picture, gets not just a description of the place but it pulls you inside that space emotionally and viscerally by placing you in the mind of someone who has experienced the war. In short it creates a narrative with a strong point-of-view that is more about the people, the place and the experience - less about the ideas regarding "war" as such. As for Operation Pegasus, the movement of NVA troops was the beginning of what would be called the Tet Offensive - the most massive North Vietnamese offensive operation during the war - and in their history - beginning in January of 1968 and lasting seventy-seven days - a round-the-clock siege of mortar and artillery fire by NVA soldiers moving south. Efficient air support by the US Air Force was problematic due to bad weather. Six thousand Americans near the border - referred to as the DMZ - were confronted by approximately forty thousand NVA troops moving south. The casualties on both sides were severe, ferocious and unforgiving. One of Burrow's most insightful pictures of colonial power. Maxim's was, of course, built by the French before the Americans arrived on the scene, as a way to entertain their troops away from home, and boost morale. The Americans kept the locale, the name, and from the looks of it, also the French Can-Can as one of the numbers in the show. The Vietnamese administrators on the left look strangely bored, or as if they were somewhere else, or perhaps they already sense they are on the wrong side of history and simply playing for time. Burrows does not shoot the girls from the audience point-of-view, nor does he shoot the men from the wings - but stations himself exactly in-between the two to get the interaction between them, and it is not a pretty sight. The degree of alienation between men and women here is brutal and without reprieve. The show, of girls raising their skirts to show off their legs and underwear, suggest Vegas and the Moulin Rouge but in another time - as if the audience and the performers were caught in a time warp - which in essence is the central metaphysical state of a person living in a country that has been colonized: they are, by definition, trapped inside a culture that is familiar and foreign - and a time period that harkens back to a past that is not theirs. Displacement and alienation become the norm. What we see here is a room full of people trapped inside an illusion from which there appears to be no escape - they must play out their roles - the men as much as the women on stage. In 1968 the Tet Offensive continued moving south at an intense, unrelenting pace. The losses on both sides were enormous - evacuation of wounded by Americans and South Vietnamese, a priority, became a nightmare of massive transportation shuttles into the hospitals of Saigon, already over-crowded. Saigon was not only the capital of South Vietnam it was a symbol of American dominance, power and invincibility. Then the unthinkable happened. After the most massive defeat of men and supplies that the NVA had experienced in their history - a catastrophic devastation - the NVA - or what was left of them - entered Saigon. Victory was, improbably, suddenly, within reach. The NVA made the difficult decision to push ahead despite their heavy losses and go for broke. American media personnel retreated to their hotels with helicopter evacuations available on the roof in case the hotels were surrounded or hit by artillery. The city was unprepared for direct street to street combat - the Americans surrounded Saigon cutting off further troop movements and supplies by NVA into the capital, but those already inside the city assumed, perhaps correctly, that they were part of a suicide mission on the front lines. Unable to contact their leaders they proceeded to attack and kill anyone that moved - man, woman or child. Those that suffered most were non-combatants - women and children - this was their nightmare moment come true. Burrow's picture The War Comes Home, Saigon is of a mortally wounded woman waiting to be evacuated by helicopter covered in her own blood. She lies on her side holding on for dear life with soldiers on either side of her, one standing to the left holding his rifle like an offering, and another one squatting so we can see his face looking off into the distance with an expression of anger, impotence and concern– or perhaps it’s simply thoughtfulness - it's impossible to say. Behind him a woman balances four boxes of something on a stick suspended on her right shoulder - a common sight in Vietnam of tradespeople moving merchandise. Another woman hurries by taking in the scene for only a second – she seems to be the only person who acknowledges the camera – the one that knows that to hesitate is suicide. The wounded woman grabs at one of the wooden planks that make up her makeshift stretcher – her long hair falls into a clump above her head that we can see is also covered in blood. Her left foot is bandaged – perhaps an earlier injury? The woman is surrounded by soldiers and photographers who wait out her last moments doing their job. The image – of the first attacks by the NVA into the heart of Saigon - is one of the most devastating images taken during the war. It is one of the great pictures taken during wartime, and the price to get such an image is something no one but Burrows could possibly know. In one sense it is a simple picture - it shows men, normally very busy and with schedules and such, waiting for a woman to die on a plank of wood so they can move on - but they have to give her this much - they have to wait with her. They don't show emotion - they don't run - they do their job – and Burrows’ framing captures that moment neither as tragedy, or as farce or as a ‘special moment’ – it is simply a moment - and we are asked to reflect on it. The picture thinks. This is Andre Bazin: “A photograph does not have the power of film; it can only represent someone dying or a corpse, not the elusive passage from one state to the other.” Burrows’ work makes it very clear that Bazin in this instance was wrong. Photographs, clearly, can capture the transition from life to death in a single image. In The War Comes to Saigon the people are framed in a very conscious manner as Burrows is on his knees so he can get the thoughtful squatting soldier in full face and create a counterpoint to the woman’s horizontal profile grimacing in pain as she dies. Those two faces together in the frame tell the story. That’s the shot that Burrows knows will work - and he gets it. The image articulates a horrifying indifference – a void where the narrative should be – a silence where a voice over explanation is usually to be found. There is nothing. Rather than a "drama" we have a matter-of-fact casualness after a chance encounter of people who probably should never have met - as the image holds on the simple act of waiting and photographing while a government and an empire collapses - and a woman whose name we will never know dies from her wounds. If cameras had always existed how many images like this would we have in our collective memories? By 1970 the war effort expands to include Cambodia and Laos, two countries used by the NVA to safely transport food, provisions, artillery and even military personnel safe from American air strikes. By 1970 that has changed. Henry Kissinger and Richard Nixon, then president, plan to bomb Laos and Cambodia mercilessly non-stop - what they euphemistically referred to as "carpet bombing." In Burrows' In Shock, Cambodia a young soldier cries and is unable to move from shock. Note how Burrows does not place the soldier's head in the center of the frame, but rather the triangle formed by his arms and hands as he attempts to comfort himself. The photograph is only titled by the place and time: Cholon, Vietnam 1969. A young boy of about seven lying on the ground on his back covered in blood appears to be saying hello with his left hand - or perhaps he is making the universal sign of surrender with only his left arm, as the right arm is severely injured and covered in blood - we can't know for sure. To the left we see a soldier who is unwrapping some bandages to use on the boys shoulder that, like his shirt, are covered in blood and shrapnel fragments. His eyes are open and looking directly at the soldier above him with a neutral or resigned expression. There is a stream of blood behind the boy’s head. On his pants leg we notice a safety pin with a string. Are they keys or identification? We don’t know. The soldier seems to have a rolled up newspaper with him but all we can see are the words Radio Television. Is it the entertainment section of the local Saigon paper? We can’t be sure. 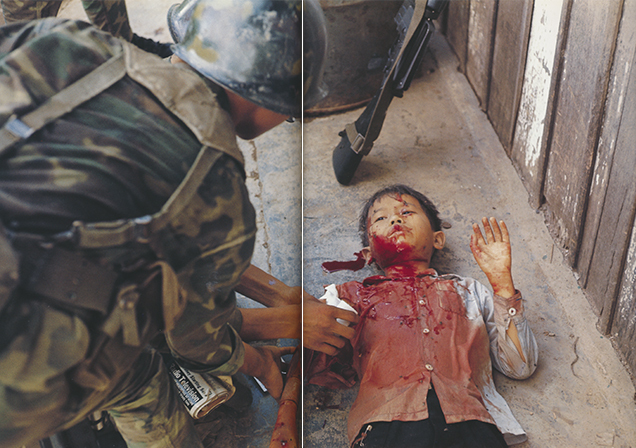 Behind the boy lying on the ground is an American rifle resting against a wall that leads the eye outside the intensity of the narrative subject and also visually creates, along with the soldier applying the bandage, a strong diagonal that cuts the image from bottom left to the top. By bisecting the image in such a strong way - left and right - and making the soldier out of focus while the boy is in sharp focus, they appear to be occupying distinctly different psychological spaces. We sense this although they are next to each other, even touching, since the soldier is applying a bandage. It is one of the most harrowing images that Burrows ever took and one of the most painful photographs taken during the war. The depiction of different psychological spaces by the use of framing, focus and color brilliantly articulates the situation for the people fighting the war at ground level and seems to encapsulate the emotional contradictions in the war – as the American soldiers simultaneously cause catastrophic violence and then try to help the victims that have survived. A young soldier finds a stray dog during the long Operation Pegasus. These sorts of 'small moments' are often more revealing that dramatic confrontational shots of major action - the soldier looks as lost as the dog - both with no direction home - they have only each other. Huế is an old city located in central Vietnam. In 1968 it had been held for a time by the North Vietnamese and the population had been forced to attend "re-education" classes to induct them into Communism. Many who did not perform well disappeared and were later found, when Huế was re-taken by the South Vietnamese Army, in mass graves. A woman finds her husband has been assassinated by the NVA - his body is already in a plastic bag, ready to be buried. The young woman tenderly holds his head with her right hand, while screaming, as saliva pours out of her mouth. Note how Burrows uses the horizon line in the back to only give a very slight sense of the sky that looks like a vast ocean - a crucial space of liberation for the picture where it can open out and breathe. The triangle of the hat mirrors the triangle formed by the woman and her husband. Despite the fact that the photo depicts an atrocity committed by the NVA, the shot, in all of its horror, is the beginning of the end for the South Vietnamese Army and the US in Vietnam. In private talks that were taped and released many years after the fact, Lyndon Johnson acknowledged that the war could not be won as early as 1967, but refused to be the first American president to loose a war - in effect the men, women and children who died after that time, did so to preserve the image of Lyndon Johnson, and then Richard Nixon who followed him, who shared those ideas of American exceptionalism, and was bound, like his predecessor, to the strategies and protocol established by the Pentagon, which had dictated the terms of the war from before the beginning. 5. Whose War is It? “If it’s not your war, who’s war is it” the editors at Life had asked in 1969 and by 1971 there were still no answers but the elections in America were then one year away and Richard Nixon, in full candidate mode, had promised to wind down the war and wrap it up – a process he named Vietnamization (the transition from American led forces to Vietnamese) and described as “peace with honor.” Of course he lied - the war did end but in 1975 when the NVA, unbowed, marched into Saigon. The South Vietnamese army, in a last ditch effort to win, or at least draw better terms in the peace treaty being negotiated by the secretary of state Henry Kissinger in France, launched an attack in 1969, preceded by massive B-52 aerial strikes, “carpet bombing,” into neighboring Laos and Cambodia hoping to cut off vital supply lines in the fabled Ho Chi Minh Trail: the life line to the NVA. This was the operation that Burrows’ was shooting from the air, using a helicopter with an open bay, along with three other photographers who were long term colleagues and friends: Henri Huet, Kent Potter, and Keisaburo Shimamoto. When their helicopter pilot, unfamiliar with the Laotian landscape got lost somewhere over the border, they realized they were in trouble. They ran into anti-aircraft artillery fire from the NVA, protecting their supply lines, and the helicopter was hit and went down. Unable to land in the difficult terrain they crashed in the jungle. Everyone in the helicopter was killed on impact. Larry Burrows, his three friends and colleagues, along with the pilot, died on February 10, 1971. Burrows' camera was eventually recovered but it had not survived the impact and was shattered. The massive "carpet bombing" would continue for another two years until it became clear that the war was lost - although it would drag on until April 30, 1975 when the last American personnel destroyed military hardware before being airlifted out of the capital. South Vietnamese army personnel went to the American Embassy hoping for evacuation - knowing full well what would happen to them - but there were not enough helicopters and planes to carry them all - and some were left begging on the roof of the Embassy as they watched the last American helicopters leave Vietnam. The same day the NVA marched into the city and raised the red flag of North Vietnam over Saigon. It was over. Larry Burrows' pictures tell stories and they chronicle their time, as photojournalists are taught to do, but Burrows also wants you to physically and emotionally inhabit the pictures in a way that can only be done through imaginative intervention. This requires a sensitivity that photojournalists, for self-preservation if no other reason, usually lack. He learned from his master Cartier-Bresson that you don’t take pictures with your eye or your head but with your whole body. You have to find the rhythm and Burrows found it. To call his work “art” is almost an insult since “art” presumes, at least at this point, a critical distance, a privileging of formal strategies, and a sense of irony, that are as foreign to Burrows as wearing a pressed suit. His images are art but they reflect a sensibility that belongs to another mindset far from the salons of New York, Los Angeles or London. Where to find it? War photography to a very large extent is the photography of trauma depicting a tenuous but emotionally gripping presentation of vulnerable, fragile, human beings confronting industrial warfare. It isn’t necessarily that photographs of men and women at war are moving but that we move them. As John Berger explains: “We use photographs by taking them with us, in our lives, our arguments, our memories; it is we who move them.” (Emphasis John Berger) Walter Benjamin would seem to be expressing a similar view: “To perceive the aura of an object we look at means to invest it with the ability to look at us in return”. Both men are asking for the relationship between the image and perceiver to not be conceived passively, but actively, as a dynamic, uncertain relationship fraught with possibilities, ambivalence, desire and mourning. Barthes was arguing for something similar in his final book: Camera Lucida. A photograph of people at war has a congenital connection to the dying and the dead that is the great strength of this kind of work, while also its primary weakness, since it cannot usually move from this trauma to another level of understanding. The poetry is intense but frozen. War pictures don’t have the benefit of the narrative trajectory provided by novels, history books or films. The traumatic photograph is an open and shut case with clues but no resolution. Most photographers accept those limitations and work within them. Some, like Burrows, consciously attack the problem bringing into play the various conventions of photographic aesthetics creating a highly complex image – a kind of meta-image – that is as tightly constructed as the mis-en-scene of any of the films made by pampered Hollywood directors who used Burrows’ work as a visual reference guide. The desire to present the world in images leads certain artists like Burrows to the conclusion that the world is vital, un-contained and unknowable, whereas a work of art is fixed and bounded on all sides by intentionality. Artists like Burrows want to include that aspect of the un-contained and the unknowable in their work through a reciprocity of directions that remain in tension - unresolved and ungovernable (a favorite strategy of Picasso among others). This is Ulrich Baer: “We need to return to a concept of aura that may permit us to partially recover the troubling realities potentially lingering in photographs of historical trauma.” Ulrich Baer’s argument here is – much like Barthes again– an attempt to come to grips with the obvious emotional power of photographs and to understand the conventions that govern them. It should come as no surprise that Burrows’ art is bound emotionally and physically to “reality” in a way that is completely at odds with contemporary fine art photographic practice - rigidly in place within academic institutions since the 1960's - that presumably questions the authenticity of those complex connections between “reality” and photographic images. The fact that writers are still struggling with that relationship after almost two hundred years is a testament to that difficulty. That presumed gap between the two dimensional photograph and the real can, without too much exaggeration, be called the fundamental reason-for-being for Fine Art photography. John Tagg articulates these ideas via the Frankfurt School and French Post-Structuralism, that elucidate fine art practice: “Photography does not transmit a pre-existent reality which is already meaningful in itself. As with any other discursive system the question we must ask is not, ‘What does this discourse reveal of something else?’ but, ‘what does it do…how does it animate meaning rather than discover it?” For Tagg photography doesn’t represent “reality” or discover it, it is instead a discursive or syntactic system that is pretending to be a transparent window to the world. Therefore from the outset photography is a lie and to a very large degree fine art practice - using the medium as an investigative tool - attempts to address this issue. It’s an austere puritan sensibility that is parochial and academic; that is, uneasy or phobic about images but in need of working out a peace treaty with them that is favorable in its terms. Clement Greenberg sought a similarly puritan cleansing with regard to painting, freeing it from the burden - or contamination - of chaotic, vulgar reality. He wanted things rigorous, resolved, and meaningful. The most powerful institutions in the USA, such as MoMA, and The National Academy of Design, that controlled - or “guided” - the domestic art market viewed Modernism as being primarily a formalist enterprise. The tenets of modern art, espoused by Picasso among many others, that sought to integrate disparate cultures, time periods, classes and formal styles - often playing off one to another as in musical counterpoint - was not rejected but incorporated into an ideological historical framework. This systematic art-history-narrative espoused a succession of ever new “revolutionary” styles, lead primarily by “advanced” European art, such as Picasso’s, in the first half of the century, then carried forward by American abstract and pop artists for its second half. Photography - according to the dominant narrative - would follow this line of reasoning avant-la-lettre, as a kind of second front in the war of the Avant-Garde. Photojournalists, being considered trade or vernacular artists akin to illustrators, were not bound to the rules of the game, and so were left alone, free to pursue their own line of idiosyncratic reasoning. This turned out to be fortunate, as the institutional obsession with the “objective” qualities of succeeding pioneer styles would prove a dead end - not because it was incorrect but because it was only one story among many, and perhaps not the most interesting, the most articulate or the most profound story. In the sciences this proposition - towards an objective narrative - was once called "logical positivism" and was discarded in the early 20th century, principally by two men: Kurt Gödel and Werner Heisenberg with their respective Incompleteness Proof and Uncertainty Principle. Gödel in particular destroyed the idea that a system could ever claim to be complete and explain itself rigorously, consistently and completely. Before Gödel and Heisenberg mathematicians and scientists actually believed that the nature of the infinite lay within the reach of finite formal systems. David Hilbert, the major proponent of logical positivism in the early 20th century, put it in terms that apply equally to formalists in the world of art, then and now: "Mathematics is a game played according to certain simple rules with meaningless marks on paper." Meaningless in this case means simply that the marks are agreed upon by a certain group - like the colored chips in a board game - but such chips are meaningless outside of the game, in the world of reality. When the California artist Ed Ruscha, at a Metropolitan Museum of Art get together in his honor, at the beginning of the 21st century, stated that "A painting is just a picture with paint" or when Frank Stella said that "what you see is what you see" they were, knowingly or not, stating axioms of logical positivism, but applied to art. For Hilbert mathematicians are not in the business of discovering descriptive truths, but of manipulating the mechanical rules of self-enclosed formal systems that are complex enough to test the skills and intelligence of the scientist. In short they believed that math is syntactic and without any necessary descriptive content - mathematics is about mathematics, and art is about art. For Gödel mathematics was a fundamentally descriptive language that described "reality" - not necessarily the quotidian "reality" that we humans are accustomed to (far from it!) - but "reality" nonetheless. The inevitable result of Gödel's ideas would be the inclusion, or re-inclusion, of incompleteness, paradox, contradiction and the unknown, or the metaphysical. It is ironic that as mathematics and the sciences discarded the "purity" of rational systems (1930 - the year of Gödel's Proof) the arts - at least within the institutions established in the West - picked it up via various "isms" and theories - many that persist to the present - the results are visible today in any art museum, gallery or art trade magazine. It isn’t only academics that adopt such theories - this is Errol Morris the filmmaker: “All alone – shorn of context, without captions – a photograph is neither true nor false…For truth, properly considered, is about the relationship between language and the world, not about photographs and the world.” The term “properly considered” suggests photographs might appear at first sight to have at least some partially realized truth but upon further consideration images turn out to be discursive constructions. Like Tagg, Morris believes that photographs are like sentences tarted up to look seductive and pleasing to the eye – but viewer beware! Underneath the glossy sheen is chaos, madness and confusion that can only be untangled and explained by language. Both arguments presume that images are directed exclusively toward our emotions, manipulating them toward some agenda, with the viewer a helpless, passive, observer. The myth within academe of the one dimensional gaze (in its passive or aggressive model) has been rampant and widespread for decades, but has proven to be, ultimately, illusory. Language systems, which can presumably be freed of emotional entanglements through rigorous scrutiny - an academic myth if ever there was one - is the key that presumably unlocks the secrets of photographic mysteries, finds the hidden agendas, and puts the riddle of images to rest. For Burrows, as for most photojournalists, who are paid to bring back images of realities most of us do not want to experience directly, such arguments must have seemed – if they were conscious of them at all – as academic and pointless. Burrows took the intensely complex connections between “reality” - or what Sigfrid Kracauer called “spatial life” - and photography as his reason for being. In effect he staked his life on it, articulating the nature of that relationship in images. “If it’s not your war, who’s war is it?” Strangely, the question remains open even today. Perhaps some historian of the future looking at pictures never before seen in the National Archives will find an answer. But Burrows’ answer to those kinds of questions was his work, which stands in direct and irreconcilable opposition to the ideas of Tagg and Morris, challenging the epistemological basis of the post-modern theories to which their ideas belong. The aesthetic that Burrows was working through did not die with him, but continued on in the work of photographers who were influenced by his work, most obviously in the brilliant color work of Steve McCurry, Susan Meiselas, Chris Hondros and Alex Webb among others. More recently Lisette Poole, Tamara Berino and Nadia Sussman carry on in that tradition - at times using video - with amazing results. What Larry Burrows left behind are images that have a penetrating emotional subtlety and intellectual clarity very far from the norms and categories that we normally ascribe to photojournalism, or for that matter to art photography - aesthetic categories that seem, in the presence of his work, like timeworn words fit for a dustbin. The synesthesia and the effects of movement and color in Burrows’ work are formal considerations – aesthetic strategies - but ultimately the work is about the tensions between those refined formal qualities and the messy narrative content, provided by reality, which he explored in depth. Burrows was a professional so it was about getting the shots. But the complexity of those photographic encounters was never watered down or made easy by fitting the pictures into a system of knowledge that would organize things for us and reduce them to issues or concepts that could be described in a sound bite, a caption or an artist's statement. They are difficult pictures. The emotions produced were bound to be complicated, ambiguous, sometimes paradoxical - a mess really - a mongrel reality that is unknowable and liable to bite.